Jammy Lips was a piece which carried over the gas mask motif in Playing Up, but this time as a performative mode which is escaped from. 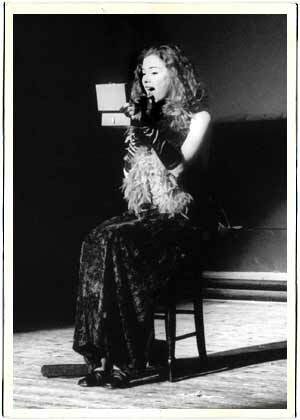 The audience sees the cabaret performer perform both as her on and off stage persona, and slowly she comes close to revealing herself. This piece included a mixture between live action and film (super 8 black and white footage shot in an old cinema and colour super 8). The piece investigated the notion of the filmic close up and the attempt to create a close up in performance. The area of particular interest was that of the mouth, as a site of female sexuality and of speech (although there is no directly spoken text in the piece). The visual images were layered with interviews with other women about their relationship to their mouths and wearing lipstick, particularly the signification of red lipstick. 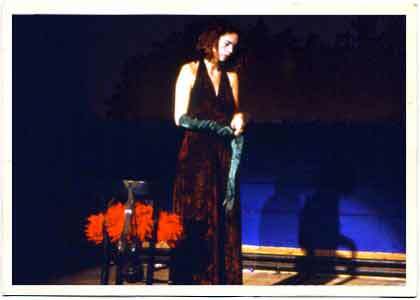 The piece was shown as part of the Bath Fringe Festival, the Expo festival in Nottingham and the Wandsworth Film Festival at Battersea Arts Centre, London all in 1999.